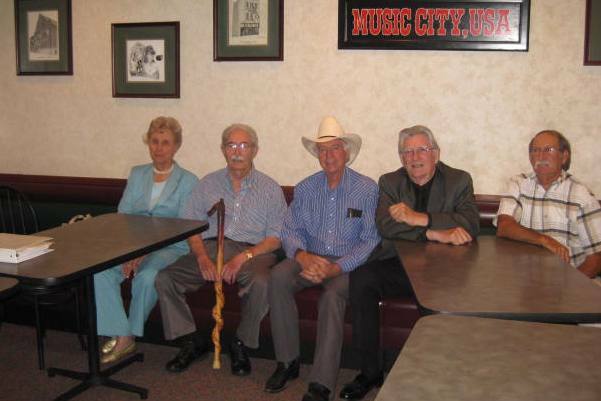 Seven members of Marty’s inner circle attended the Marty Robbins band reunion in Nashville on 18 July. Joe Vincent played steel for Marty in 1953-54. Earl White (now an Opry staff musician) was one of the original Tear Drops, Marty’s first official band. Jack Pruett played lead guitar from 1956 until Marty’s death. Okie Jones drove the bus and ran the recording studio. Marty hired Haskel McCormick on banjo for a year while Twentieth Century Drifter was on the charts. Joe Babcock joined the Glaser Brothers when Chuck left for the Army in 1959, and he stayed with Marty until 1965. Marty’s son, Ronny Robbins, completed the group. Thanks to Joe Babcock for reserving Shoney’s meeting room and to my sister, Kayo Paver, for helping me host the reunion. 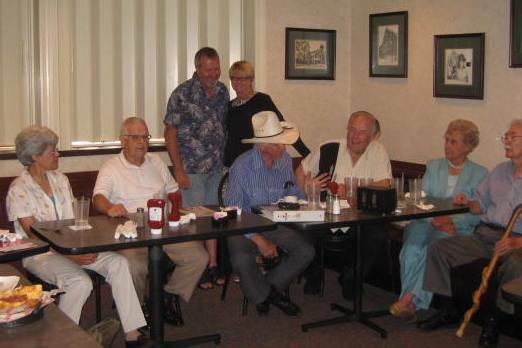 Jim Glaser couldn’t be at there because he was in Norway, and Bobby Braddock was involved in the Country Music Hall of Fame “Poets and Prophets” ceremony for Matraca Berg. Several others who planned to attend had last-minute conflicts. During our Nashville week, while Kayo and my daughters explored the thrift shops around town, I was at the Country Music Hall of Fame library, going through the research material collected by Barbara Pruett for her 1990 bibliography, Marty Robbins: Fast Cars and Country Music. (Barbara told me, “You make me happy to know that all of the material I donated is being used the way I hoped it would.”) Thanks to John Rumble for granting me access to the Country Music Foundation archives. I could spend weeks in that place! I also visited six different offices at the Davidson County courthouse and was impressed with the helpfulness and friendliness of all the clerks and with the computerized research systems. Kayo and I stopped in the Ernest Tubb Record Shop one evening, and I introduced myself to the clerk even though we didn’t expect this 20-year-old to care about Faron Young’s biography. Instead he told me it’s a great book, he’s read it, and he’s a huge Faron Young fan. I thanked him for keeping the legends alive into the next generation. Friday night Kayo and I were walking along Lower Broadway when we heard “El Paso” coming out of Robert’s Western World. That’s where we spent the rest of the evening. Jesse Lee Jones (the current owner of the club) and his band were so good that we returned Saturday night to listen again. They do classic country music, with an occasional (and too short) touch of western swing and traditional western music. Jesse grew up in Brazil and he calls Marty Robbins his hero. David Tanner on upright bass is especially impressive with his singing and songwriting. Here’s more info: http://www.robertswesternworld.com/brazilbilly.html. Marty would be pleased, I’m sure. A man at the table next to us was wearing a Korean War Veteran cap, so I introduced us as retired Navy, and he introduced his USMC son. The Marine mentioned being on Iwo Jima, and I said I’d been there, too. But he meant the aircraft carrier and I meant the island. Response: The only Monday night I was in Nashville (11 July) is the only Monday in July that the Time Jumpers weren’t at the Station Inn. I was sorry to miss Kenny and Dawn and the group. Response: I agree that is a great resource. Our young waitress at Shoney’s on Saturday had never heard of Marty Robbins, and she assured me she would type his name into YouTube to learn about him. This entry was posted on Tuesday, July 21st, 2009 at 6:42 pm	and is filed under Hidewood, family, Newsletter. You can follow any responses to this entry through the RSS 2.0 feed. You can leave a response, or trackback from your own site. was there ever a gentleman by the name of Bobbie Allen that play with Marty Robin? I have never heard that name. I don’t know who it could be.